Cover Love includes a cover, blurb, buy links, and social media contacts for the author. 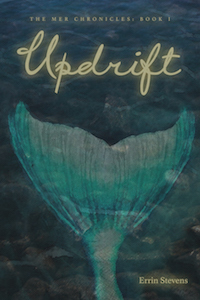 Today's featured book is Updrift by Errin Stevens. Since her father died, Kate Sweeting’s home life has been in the pits, her well-being on life support. Her future looks desolate until she and her mother, Cara, make another plan: abandon their shriveled existence for more promising prospects on the coast, where Cara can play small-town librarian/bachelorette and Kate can figure out what’s up with that secretive Blake family from the beach. Everyone is eerily captivated with Kate and her mother, and Cara is the first to figure out why when the man of her dreams arrives all dripping and devoted and closed-mouthed about what he intends. Kate is willing to go along with their subterfuge for a while but eventually makes a charge for the water to learn what her mother is hiding. Gabe Blake is there waiting for her…and so is someone considerably less friendly. By the time Kate navigates her way home, everything will have changed for her—what she feels, what she wants, and what she’ll risk to be with the man she loves. Errin Stevens writes paranormal romance from her home in Minnesota, where she lives with her husband and son. When not taming unruly storylines – or reading everything from mythology to contemporary romance to romantic suspense – you’ll find her swooning over seed catalogs (winter), or digging in the garden (the other three days of the year). Visit her web site for release updates and random essays on writing and mothering.